Last week at a “Parent-Principal Coffee” at Sahare’s middle school, in a surge of misplaced over enthusiasm, I signed up to represent Broomfield Heights Middle School at a District Parent Council. Sounds impressive doesn’t it? Yep. Don’t know what I was thinking. Actually, I don’t know what I was doing at a “Parent-Principal Coffee” in the first place! We have been in Colorado for a year now and last year, we were new to the school district and I was busy so I lay low. This year, I have decided to play a more active role in my children’s education; very noble and self sacrificing, I know. It’s not easy though. I find that I have such little time to accomplish things at home without adding volunteering at the children’s school or the mosque. I don’t know how working ladies do it. I am impressed at those women who have full time jobs and a family and still they manage to cart their children around to extra curricular activities and run their errands. PHEW, I am tired just writing that sentence. I understand why people don’t attend PTA meetings or volunteer at school events. It’s not easy. For me, it’s not easy because of my physical limitations and also, my medications affect my ability to fight infections so I am really not allowed to be around children. I try and help in other ways, like cooking for school functions, or helping out at one time events. That’s why volunteering to take on this representation job was definitely me being way too over confident! However, it wasn’t too bad, they had their first meeting last night and it went fine. The DPC meets with the superintendent of the school district every month and collects information from him and other organisations and brings it back to their respective schools. I will be doing that for Sahare’s middle school. Wish me luck! Like I said, it’s quite hard to manage a house and then run for a meeting for two hours. I had to leave the girls in charge of Laith and to make sure he went to bed on time. I rushed to get dinner ready and myself ready. Today I have parent teacher conferences for Sahare and I volunteered to prepare food for the teachers, it’s easy stuff but I still have to get our dinner ready too. Tomorrow, I have to help Laith with his fundraiser and then prepare a dessert to take to the mosque for a lecture there. So, yes, I understand how hard it is to be a part of volunteering and attending school meetings and functions and why there is always such a poor turnout at these meetings. However, does that mean we take no interest at all? I for one cannot do it. I must be interested and concerned (it’s a control thing I think) When my children were in private school, I was the PTO president for two years. No one ever showed up at the meetings and no one ever wanted to do anything, and these parents are the ones, with their lack of interest and commitment, that showed me how important it is to be a part of your child’s education. I remember the frustration and annoyance I felt and those feelings are what get me involved in my children’s school now. So, my recipe has nothing to do with what I wrote above; that was just to let you know what’s going on in my life and my two cents worth. The recipe story follows. Last week I went rummaging through my store cupboard and fridge looking for lunch. The fact that I was willing to cook for just myself proved that I was starving. I don’t like to cook for just myself. In fact, I don’t like to take time out to eat. When we fast and don’t have to eat, it’s like I have SO much time to do stuff because I am not stopping to eat. I am a strange foodie. I was reading a blog or some article a while back in which this person mentioned that it didn’t matter how busy they were, one thing they didn’t compromise on was their food. They made time to eat a healthy lunch/dinner/snack. Unfortunately, with me, that’s the first thing that suffers when I am rushed off my feet. I grab anything and usually it’s the least healthiest option. Most of the time, I snack on little stuff for lunch or eat leftovers from the night before. When I have to actually cook for lunch, that means that we are running low on groceries! I ended up making one of my favourite dishes just using a few ingredients I did have at home. This particular dish was made by my mum every Eid morning. It was a tradition in our household and I really looked forward to it. I still try and make it every Eid morning for breakfast before we head off for prayer. My mum used to make it with minced/ground lamb but I have made it with ground beef, with chicken and even vegetarian. Last week it was the vegetarian version and it hit the spot beautifully. Heat the oil in a skillet or fry pan. Break the eggs and fry till they are almost set and then break them up and let them cook fully. Once the eggs are cooked, add the garlic and ginger, cook a minute. Add the tomatoes, the onions and green chillies and stir fry. 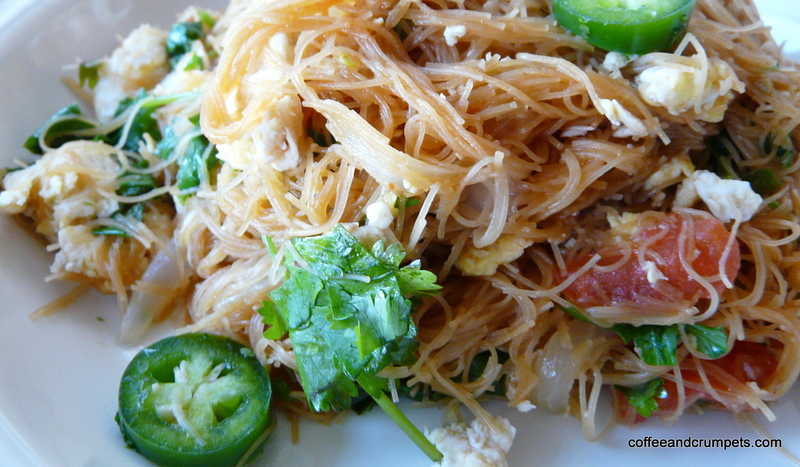 Add the vermicelli noodles and fry. If the pan looks dry, add a bit more oil. Fry the noodles for about 2 minutes and then add the water. The noodles will soften up and cook all the way through. If they look dry, add 1/2 cup more water to make sure they are soft and cooked. Toss in lots of chopped cilantro. *NOTE: you can add anything you like to this dish, I have made it with frozen corn and peas and a medley of other vegetables and meats. Toss in whatever is in your fridge, there are no rules. I like to eat it doused in hot sauce. So, these are my kharay seviyan, as we call them them, or savoury noodles. They are one of my favourite dishes my mother used to make for us. 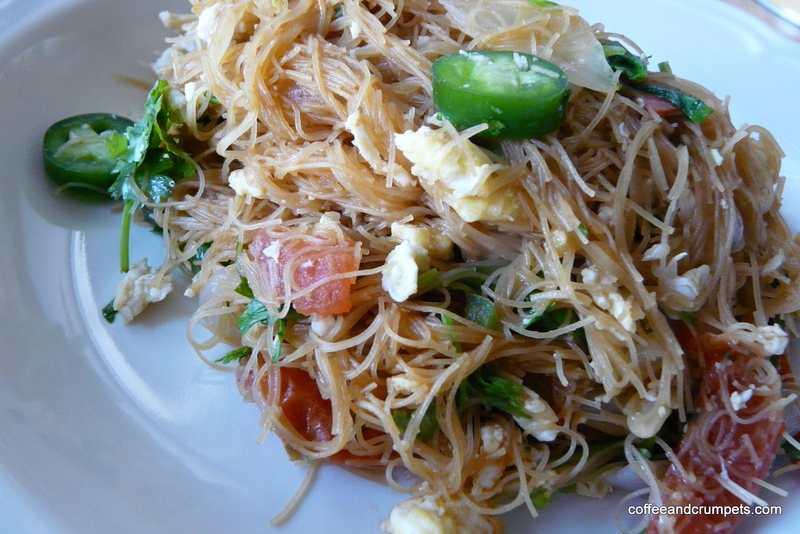 I hope you will seek out the Indian noodles, easily found at any Indian grocery store, and make this dish. Try it with minced beef or lamb, it’s a great twist to the traditional pasta dish. I hope you have a great weekend. This weekend is my daughter, Noor’s 14th birthday. We are taking her and her best friend Grace, out to eat on Sunday. Thank goodness she didn’t want a party! What exciting things do you have planned for the weekend? 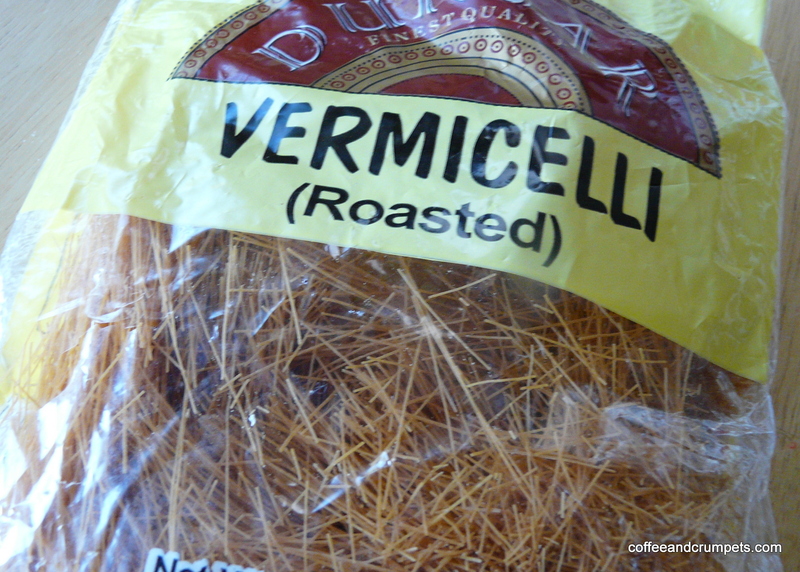 I have never cooked with vermicelli. My mother in law uses it to make some kind of sweet Indian dish (that i don’t like LOL). I’d love to try a savoury version like this one. Aaaah, yes. The sheer korma. I personally don’t like the runny one and the one I make is thicker and filled with dates, almonds and lots of butter. Butter makes everything ok.